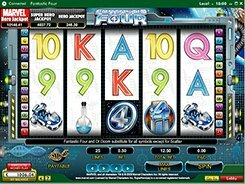 Fantastic Four is an awesome feature-stuffed video slot based on a series of Marvel comic books and equipped with 5 reels and 25 paylines. The slot has flexible betting options enabling you to wager anywhere between $0.05 and $125 per spin. 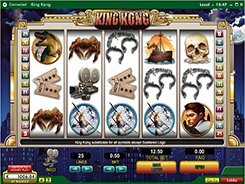 There are five different wild symbols in the game – Mr Fantastic, Human Torch, Dr Doom, Invisible Woman and The Thing – that yield the largest 5000-coin jackpot for spinning in five matching wilds on a payline. Besides, the slot has a scatter symbol that triggers a truly fantastic bonus feature when 3+ appear in view. Before the feature starts, you are asked to pick one of the five free game modes you want to play. E.g., selecting the Mr Fantastic feature awards 15 free spins with all payouts doubled, and an expanding wild symbol on reel 1. In the Dr Doom Feature you get an unlimited number of free spins that continue until Dr Doom appears on reel 5. If you opt to play the Invisible Woman feature, you get up to 10 free spins with the chance to win extra spins whenever she lands on the second reel. PLAY FOR REAL MONEY!